Hey there. Let's reach into the vault 'o stuff and see what awesome gadget is up for review! Today's item comes from our good friends at Honstek: The Honstek H9 Bluetooth Wireless Headphones! Who doesn't like a great set of headphones? Especially some that are as modern and stylish as these! Before we get into my experience with these bad boys, let's talk SPECS! Bluetooth Range: Approx. 30 ft.
First off, the box. I'm not a fan of the, "brown box", look. The box that any product comes in is the first impression and seeing a brown box is very blah. The box of the Honstek H9 Bluetooth Wireless Headphones is pretty blah. The, "H9" is in the middle of the front of the box and there are some specs on the back of the box. Other than that... nothing special. Once inside, the Honstek H9 Headphones and the additional earpieces are packed neatly inside a smaller box and the charging cable is tucked away on a side of the box. First things first... the charging cable is pretty short. Like... super short. The cable is only about 6 inches long. That's not including the ports. I'm not a very big fan of short cables. I feel that it extremely limits where you can use them. Since I'm someone that's always up and about, a longer cable is preferred. Especially since the charging ports available to me are from a desktop computer or an outlet. 6 inches from there is simply too short for my taste. The headphones and the earpieces are nicely packed in the smaller box. 2 sets of earpieces are in small plastic zip lock bag and the other set is already in place on the headphones. The headphones themselves look real stylish. The headphones are made of soft, yet durable rubber and there is a metal strip across them. There is a large button on the right ear piece and to keep the look symmetrical, there is a similar "button" on the left, but it not a button. The volume buttons sit right on top of the ear piece and the USB port in on the bottom. I LOVE that the rubber flap that covers the USB port has a tiny tab sticking out. It makes it super easy to remove the flap to get to the USB port. I have seen other flaps that have dips or do not have a tap and I have struggled greatly to open them. Good to see that this was super easy to get to. Love that little tab on the H9 Headphones port flap! There are also soft rubber pieces that loops over the ear pieces. Since they are in the shape of an ear, I'm assuming that they go behind your ears to keep them in place. The part that goes in your ear is angled from the rest of the ear piece. I love that they are. Speaking from experience, I've noticed that those that are angled fit into the ear better and just feel better in general. It's a more natural fit. The design is relatively unique and I don't recall seeing any headphones with this type of look. I just hope they sound as good as they look. So, let's plug in these bad boys and give them a go! Once the H9 Bluetooth Headphones were charged up, I put them on to try them out. In case you are confused as to which ear piece goes where, there is a small L or R on each side to tell you which ear in belongs. A good rule of thumb for this particular set is that the controls are on the right ear piece. Also, I love that the in ear pieces seemed to just have this natural fit with my ear. That created a very light suction and reduced outside noise tremendously. Also, the rubber ear pieces made it extremely comfortable to wear. As for the long ear like rubber pieces, I find out that those go BEHIND your ear to keep the headphones in place. Overall, they feel pretty good. And the best part is that they do keep that comfort level or long periods of time. I commute to work every day for over 4 hours and I need to have a pair of headphones that will not hurt after some use. I'm glad to say that after wearing these for several of my trips, the comfort level stayed the same. Bravo, Honstek! 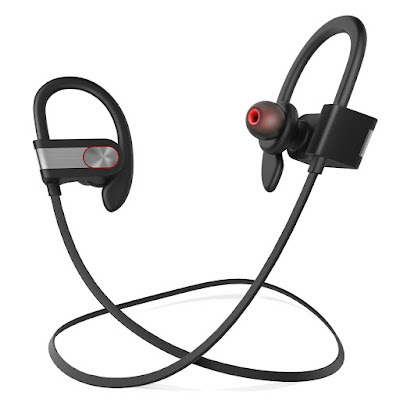 I want to briefly touch on the battery life of the H9 Bluetooth Headphones. I'm really pleased with the charging times and the playback time. Charging up from dead to full takes no more than 2 hours. Actually, it's more like an hour and a half, and that charge will usually last you about 8 hours. As I made mention, I commute almost 4 hours a day, sometimes more, and I need my headphones to keep on powering me through those trips. Being able to last for approx. 8 hours is great since that will assure me at least 2 days worth of playback. More than enough time to charge em up when I get to work or home! Once the H9 Bluetooth Headphones were on, I decided to pair them up to my smartphone. Just like any other Bluetooth enabled device, you press and hold the power button until the indicator light starts flashing red and blue. I like that a voice prompt informs me that the headphones are now on but was a bit disappointed that I did not hear a voice indicating that I was in pairing mode. I must have stood there holding the on button for what seemed like forever because I was waiting for the voice prompt. I even thought I did it wrong and tried turning off (power off voice prompt was there) the headphones and trying again. I only realized that I was in pairing mode because the headphones became visible as a pairing device on my smartphone. Not a deal breaker, but it would have been nice to know that I was in pairing mode. Anyways, they more than made up for it by clearly labeling their device as, "H9". I have a huge disdain for weirdly labeled devices and I love that this was as clear as day as to which device it is. After having so many bluetooth devices saved on my smartphone, I want to be able to quickly identity the devices and not have to look up some weird set of numbers and/or letters. By the way, if by chance your device is asking for a connection password, that password is the default, 0000, password. So once I was connected (voice prompt goes, "connected", I wanted to test out the range. I left my smartphone on the floor, outside, and started walking. At about the 35 foot mark, I got disconnected. While walking back, I noted that it reconnected on its own so I like that it does have an auto connect to the previous device. As for the range, let's say that you have a good 30 feet connectivity range to work with. Not bad. It's about standard stuff, I believe. As previously mentioned, the right ear piece of the Honstek H9 Bluetooth Headphones have all the controls. That makes it pretty easy to control the device with a single hand. The single button on the outside of earpiece is the power button and the volume up and down buttons are sitting at the top. The power button also works to start and pause music, answer and end calls, redial the last number called, and used to switch languages. Yeah, if you press and hold the power button and press the "-" button, you can toggle between English and Chinese voice prompts. So... just in case you start hearing Chinese voice prompts, you know how to change it English. Anyways, the controls are relatively easy to use and remember. + for added volume and - for less. Pressing and holding them will skip music backward and forward respectively. Super easy to get to buttons! Now... the call functionality is usually a hit or miss when it comes to wireless headphones. As for the Honstek H9 Bluetooth Wireless Headphones, it's a bit of a miss. The biggest issue here is the placement of the built in microphone. You'll usually find a control bar on the wire connecting the earpieces of bluetooth headphones. This provides the user's mouth to be closer to the microphone so that they can be heard well during a call. The built in microphone on the H9 headphones is on the INSIDE part of the right ear piece and is partially blocked by your ear. This makes for a tough time being heard while using the call functions. I tested it out through a regular call and through a Skype video call and the results were the same: I just wasn't being heard well. The Honstek H9 Bluetooth Wireless Headphones have an AMAZING sound! Like... WOW, amazing. The sounds quality is simply top notch here. I don't know if it's just a well built system, I don't know if it's the added power of APTX Tech, or I don't know if the noise cancellation tech is at play here, but the sound is really, really, REALLY good. Per the norm, I went through a series of music genres to test these out. Everything from rock to classical to rap to metal. I'm a fan of music, I have it all. lol Anyways, putting the headphones through a wide range of music gives me the best test to assess just how good the sound quality is. It's like having an equalizer that focuses on bass. Music with heavy bass will sound awesome, but other genres with little to no bass will have their sound quality suffer. After going through a few hours of music, the H9 Headphones pass with flying colors. All sounds shined. The highs were crisp and crystal clear, the mids were not muddy at all and could be well heard and the bass... my goodness... the bass was booming! And just to be fair, I went ahead and watched a couple of movies and TV shows just so that I can get a good idea of how well they performed. Needless to say, the sound quality did not suffer at all. The Honstek H9 Bluetooth Wireless Headphones is one awesome sounding set of headphones! The sound is simply astounding and you have to give them a listen to do it justice. Though it doesn't perform as well during the call tests, the call function takes a back seat to the awesome sound quality. If you are looking for one great sounding headphones set, look no further. The H9 brings the boom with authority! Pick one up right now at Amazon for under $26! So what do you look for in a quality headphones set? Looks? Design? Sound quality? Functionality? Let's hear it in the comments, friends!